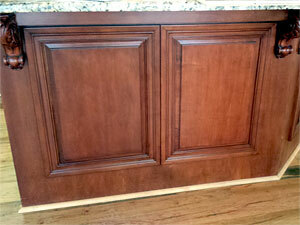 We do both cabinet painting and cabinet refinishing. If you are looking for a cabinet update that will bring new life to your kitchen or bath, we can apply a factory like painted finish or change your existing finish by darkening the wood stain, glazing, distressing, etc. Painted cabinets can brighten and revive an outdated space. We can paint most all surfaces, including wood, laminate, vinyl, and existing lacquer or oil polyurethane. 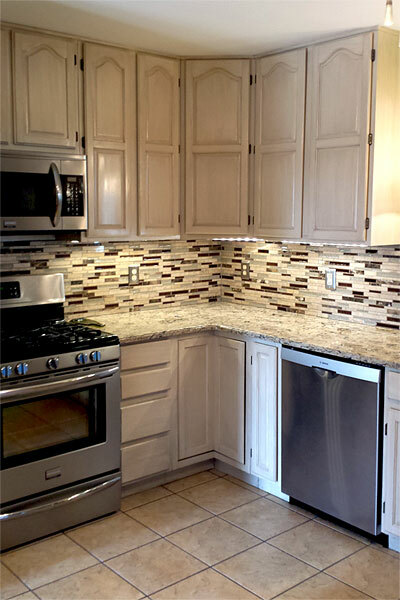 Properly prepped and painted cabinets are durable and will provide years of enjoyment. We assess each project individually to determine the necessary steps to ensure a beautiful, lasting finish. We never skip the proper prep steps when painting cabinets. Proper preparation is essential for ensuring adhesion and durability. Our standards for durability are high. We do not use house paint on cabinetry. We use water-based lacquers specifically developed for use on kitchen cabinetry. They meet or exceed standards established by the Kitchen Cabinet Manufacturers Association. The result is a durable and professional looking finish. 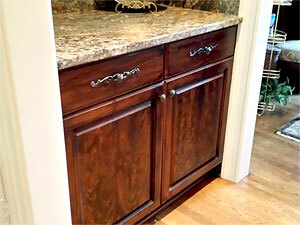 Beyond painted cabinets, cabinet refinishing provides numerous options for satisfying your vision. Without messy stripping, we can change your existing finish in a variety of ways. YES! WE CAN SAVE YOUR CABINETS! 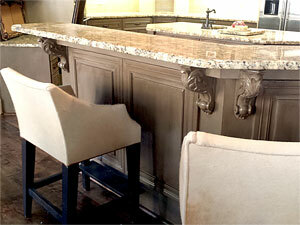 For example, Oak cabinets can be updated by toning out the golden color, or even staining to a darker espresso color. The pink effect of pickled cabinets can be changed to a much more modern brown tone with a simple process, and you will still see the wood grain. If your cabinets no longer fit your style, you will be amazed what we can do for a fraction of the cost of replacement. 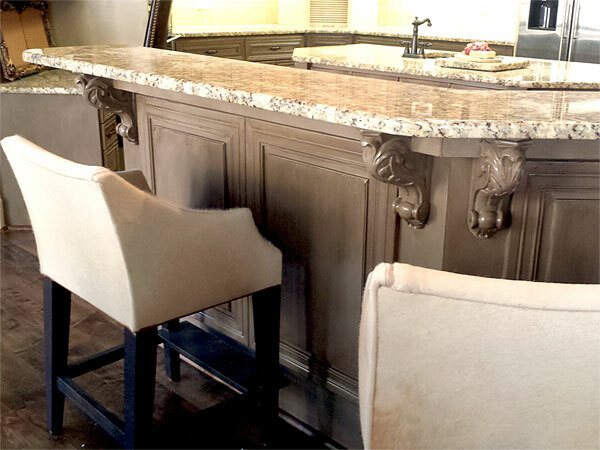 We offer all of the finishes you would see in an upscale custom cabinet shop, including distressed finishes, cabinet glazing, textured European finishes, tuscan finishes, etc. There is no messy stripping or highly toxic products, and the process creates a minimum of inconvenience to you. 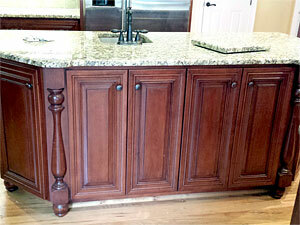 You can use your kitchen during most of the cabinet refinishing process! Each cabinet refinishing project is unique, and we carefully consider your existing finish and desired style when designing an appropriate process for completing your cabinetry. Our standards for durability and professional results are unmatched. Our materials are kitchen cabinet grade waterborne lacquers that meet or exceed standards established by the Kitchen Cabinet Manufacturers Association. Please call us at 828-773-8164 for your free in-home consultation.